Oh how I wish I had taken a before shot!!! (I sometimes get so excited about starting a project that I forget to document it.) 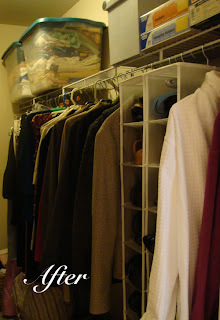 One of the services I offer clients is organizing. Often times, before you can get down to designing or decorating, you have to focus on getting rid of the clutter so you can actually see the room. This particular client has an awesome walk-in closet, but it was looking like a small pipe bomb had gone off inside it! She had boxes of stuff that she had not even opened in three cross country moves, bills and papers strewn over the floor, and stuff stacked on top of more stuff. So, how does this happen? Well, very easily. This client works a lot of hours and every time she moved she didn't have time to properly sort through her stuff. Her belongings got crammed into boxes and she kept shoving papers into bags to be sorted later. Every time she had people over, she would scoop everything up in her bedroom and put it in her closet. Out of sight, out of mind. BUT, not anymore!!! It took us four full days of going through her belongings and setting up systems for everything. We bought a filing cabinet to store all her papers and documents and set up a home office. We then tackled the storage situation and bought a bunch of containers. Now, like items go into particular containers. For instance, all her travel bags go in one container, her christmas decorations are in another, and so on. She still has some stacks of papers to go through, but she now has designated places to put everything. Best of all, she is getting rid of all this mental weight in her life. She now is not embarrassed to have people walk into her bedroom and she is organized in her personal life. It lifts a tremendous amount of stress off her shoulders. And better yet, we can now get down to the fun part of redecorating her space!